Pine-cone crafts, cranberry sauce, and…poultry handling. As Thanksgiving and other winter holidays approach, many of us find ourselves thinking about these things. More than 60 years ago, and not just for the holidays, the Communicable Disease Center (now the Centers for Disease Control and Prevention) was thinking about food safety, too. 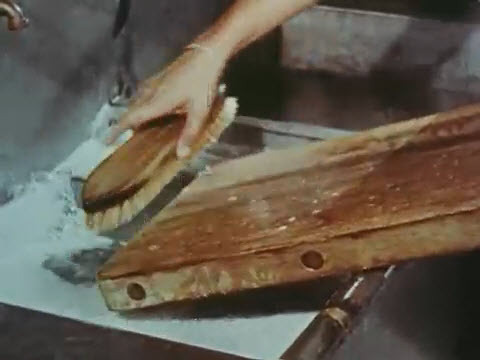 In the 1950s, the CDC produced a food-handling film series demonstrating what—and what not—to do when storing and preparing food. For one title, An Outbreak of Salmonella Infection, the U.S. Air Force contributed the personnel and setting for a lesson in how sloppy practices can transfer microbes on a chicken carcass to multiple dishes across multiple meals. The amateur actors play their roles with heart, and many bedside buckets, as the film takes the viewer through a sickening process involving an inadequately cleaned cutting board, poorly heated gravy, and leftovers that should have been refrigerated. with all the troublemakers washed off. Because the cutting board was not thoroughly cleaned, giblets for gravy, and chopped chicken for salad, were also contaminated. The film highlights several missed opportunities to kill the offending organism, salmonella typhimurium, all of which still apply to today’s cooks and kitchens. Besides An Outbreak of Salmonella Infection, 1954, NLM also holds An Outbreak of Staphylococcus Intoxication, 1954, in which a chocolate eclair plays a starring role. Other series titles not held at NLM include Kitchen Habits, 1954, and Refrigerated Food Storage Principles, 1951. Check NLM’s LocatorPlus catalog or contact the Historical Audiovisuals Collection for more information on our public health related films and videos. I do scrub my wood board frequently.However,I also use bleach to complete the work;rinse with water and then let itself dry..